I was organizing my pink 'kikay' box when I saw these lovelies. I'm not really sure why I bought these back then but somethings telling me, 'you lust on them then, that's why you picked them'. 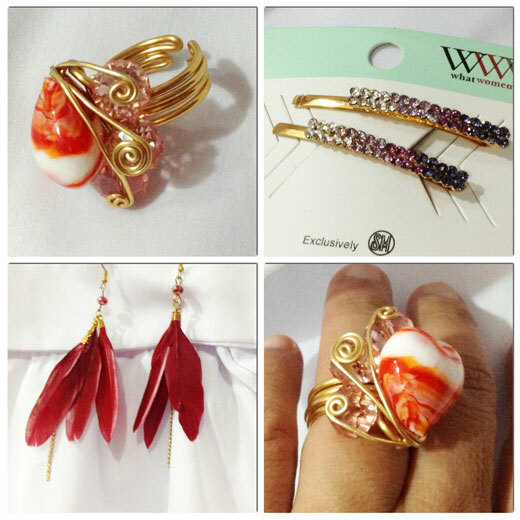 This ring was a find at a Marco Polo Christmas Bazaar, the hair clip was scored at a random, I might have been thinking Pocahontas at that time I went to cash out this feather earring, but they're pretty I swear. I have a box of them here and I wonder why I can't find one when I'm looking for one, yeah, women!